Lyme disease is a global epidemic. 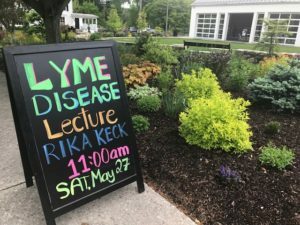 Join Rika Keck for a health-talk at the Depot so you can become informed about Lyme disease, co-infections and transmission (it is not only ticks.) Learn about the complexities that keep many individuals sick, even after a correct diagnosis and antibiotic treatment. Whether you are dealing an acute infection or ongoing sickness post-treatment, Rika explores key points that impact the body’s ability to heal, or live more easily with Lyme disease over years. and timely talk in the Depot.